Season Four: "happy new year"
Everyone spends New Year's Eve at the Steadman's. People begin filtering into the Steadman's New Year's Eve party and Ellyn confesses that she's afraid she messed things up with Billy by never asking if he had New Year's plans, so they never planned anything. Elliot shows up with the kids, but Nancy was too sick to come. 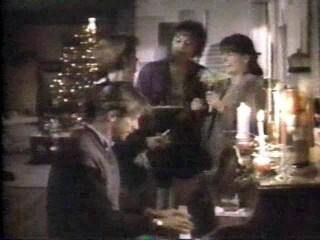 Melissa takes care of Emma, leaving Gary time to play around on the piano. Ethan keeps Ellyn company in the kitchen, reading Johnny Tremain for school, and she even asks him if she should call Billy. Ellyn and Gary both grab the phone, each wanting Susannah and Billy to call, but it's Hope's mother instead. (Elliot is progressively drinking more and more.) Peter Montefiore shows up with a woman and the woman's daughter, then takes to playing the piano for everyone. Ellyn pulls Hope aside to tell her why her mother called. Ethan gets stuck with Melody, the daughter of Peter's friend, and they hit it off because Melody's father died of cancer. Russell shows up with Melissa's Christmas present just as Gary finds out that Susannah is snowed in up in New York. Michael asks Ellyn what's going on and she says that he needs to ask Hope, that it's about someone Hope knew when they were young. She, of course, says that nothing's wrong. Gary is getting very frustrated and goes out for a walk to clear his head. Elliot visits with Patsy, Peter's friend, and learns that she grew up with Peter in Philadelphia. Peter catches sight of Russell and they awkwardly reacquaint (see "strangers"). Michael tries again to get Hope to talk and she tells him that Patrick Devlin, a boy she knew in high school has died in an accident. Patsy plies Peter for info about Russell and he confesses that he did indeed sleep with Russell a year ago and never heard from him again. Music cranks up, people start dancing, while Ellyn calls Billy's machine and blithers for a while. Michael tries to get Ellyn to tell him about Patrick Devlin, but she avoids the issue and manages to escape to the dance floor. Michael dances with Hope and asks her if she was in love with Patrick and if he was the first man she ever slept with. Understandably enough, Hope quietly walks away. Ellyn calls Billy's machine again and finally says that she wishes she was spending the evening with him. Elliot has to discipline Ethan for something, but Melody confirms Ethan's story and since Elliot is halfway to toasted, it changes Elliot's mind. Emma is being extremely fussy and Melissa is still by her side, trying to settle her down. Peter and Russell are talking quietly, watching everyone dance. Melissa tries everything to settle Emma down, even telling her the story about how Gary was put in jail for traffic violations and she posted the bail in the middle of the night, then how confusing it is for her to have not liked Susannah but having to accept her now. Gary returns from the walk to find out that Susannah has hopped a train home, so he scoops up Emma and runs off without really talking to or properly thanking Melissa. Patsy keeps Elliot company as he downs some coffee and remains pleasantly sloppy. Just before midnight, Billy arrives and he and Ellyn happily reunite. Melissa takes off outside in the snow as the new year comes in (Russell and Peter kiss on the cheek). Michael finds Melissa outside in the snow and she has experienced some sort of renewal of faith, excited about the upcoming year of 1991. Out by Russell's car, he and Peter talk a little and Russell invites him to take a walk. Melody gives her phone number to Ethan so they can talk sometime. Elliot is passed out, so Michael prepares to drive them home when Hope finally tells him about Patrick Devlin. They met in high school when she was 16 and they had a secret fling until she went to college. She was miserable without him, so he came for her and they went away for a week on his motorcycle. She left him though and went back, telling him she would decide by New Year's what she wanted. He returned then, asking her to go to Santa Cruz, California with him and she refused to go, telling him to leave and that she didn't want to see him again. He stood outside in the snow, calling her name, and that was the last time she saw him. Michael simply makes sure she's all right, then goes to drive Ethan and Elliot home while Hope watches from above. Melissa once posted $80 bail for Gary; there's a large Christmas tree; Michael's mom has moved in with Ben and given them the piano; Hope first slept with Danny Garver in high school; Ellyn comes bearing meatballs to the party; Melody is in 7th grade and skipped one grade; Russell brought a Christmas present for Melissa. "Peter and Russell make peace. Russell dodges Peter for half the party. Finally Peter confronts him (in the kitchen, I think) joking that pretty soon they are going to run out of rooms to hide in. This breaks the ice. Russell owns up the fact the real reason they are avoiding each other is so they don't have to answer the question of "Why didn't you call me?". This gives us the transition to the scene later on when we see them talking by the fire." Melissa's coonskin cap appears. Mark Harriton is sporting a gold loop earring in his left ear. With apologies to Seinfeld - this episode was the original show about "nothing". The closest thing to a plot is the slow unfolding revelation of Hope's past relationship. But mostly people flow in and out. Susannah can't get there; Gary goes walking; then she's coming home; Gary returns and Gary and Emma leave. Melissa leaves, then returns. Billy shows up. We almost expect Nancy to come through the door - but she doesn't. It had the ebb and flow of a real party. Even so it is one of the most melancholy and moving episodes the show ever did. All the more so as everyone looks forward to 1991 - "it's gonna be a great year!" - and in hindsight we can see Gary's death, Michael and Elliott breaking apart, Michael and Hope drifting farther apart, and Michael's near nervous breakdown. To this day I cannot hear the Beatles "In My Life" without feeling Hope's loss of a passion that will never be rekindled. Big thanks to Molly O'Brien for the following observations about the strong parallels between the episode and James Joyce's "The Dubliners." "The snowy back drop, the seasonal festiveness and party scenes, the dancing and music, the death of the Irish boy-Hope's one time love, Michael's gaze down onto the snowy street illuminated by the streetlamp, the distance between Hope and Michael, I could go on and on and on... I've never actually read anything else about these parallels, or if the writers really were inspired by Joyce, but the similarities seem a little too clear." I think the connection between the two is so strong I would describe "happy new year" as a reworking of "The Dead." I think the difference between the two goes a long way to definining the point of the episode: "The Dead" more or less is about this man's realization that he is not the great love of his wife's life. "happy new year" makes a much finer distinction--Hope and Michael's marriage is not the romantic ideal mourned by Hope, but it is the prototypical love relationship in the show. This contrast between the romantic ideal and a more pragmatic, "true to life" love of course resonates with episodes throughout the series. Whenever I think of what made thirtysomething great, I think of this episode: Imagine taking a work by a giant like Joyce, making it relevant to an audience 60-70 years later, and maybe even making it better. Amazing. I was poised to tell you about the parallels with Joyce's "The Dead" and the New Year's episode, and I find I was beaten to the punch. They are amazing -- sort of a fun theme & variations, probably inspired by the story and by the movie of The Dead, which had come out not long before the episode may have been written. OK, big problems with the Patrick Devlin story. If Hope is attending Princeton and this is her freshman fall semester, why the hell does she have a waitressing job, how does she just take a week off to roam the Pennsylvania countryside? These objections exist apart from the other continuity problems given the information we are shown in "the burning bush" which shows us a very different teenage Hope. [5/13] Revision based on the parallels with "The Dead"--I'll suspend my objections that are noted above in light of the need to hold to the plot of "The Dead." Still, I'm a stickler for continuity and this really does deviate from some previous statements.